Eek! Taxes always make us self employed people cringe … How much am I going to owe ?!? Well tomorrow, Tuesday April 18th is the deadline to file your Tax Returns for income earned in 2017 for all you people in the US. Unless you have filed for an extension, you should know how much you are cutting a check for. Phew! 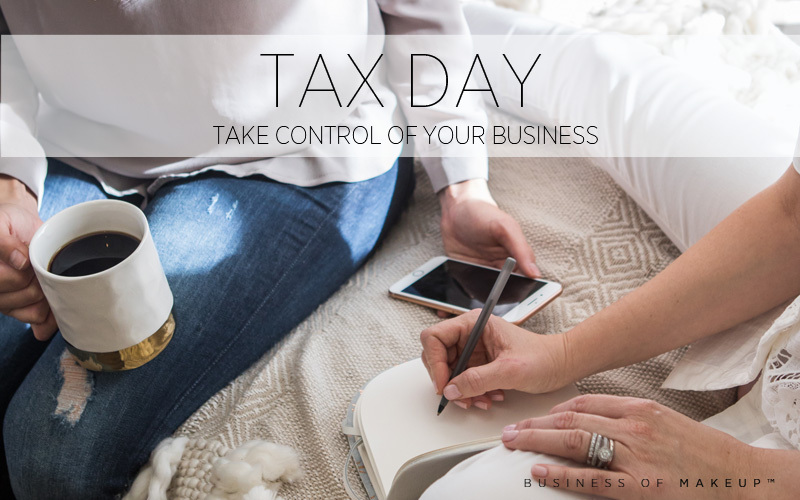 With every client that sits in my chair, I plan how much I need to set aside to pay my taxes. And you can too! It’s really quite easy. Now I am not a CPA, so please consult with an accountant when making any decisions about how to strategize financially for your business. You pay taxes on NET INCOME (take all the money you made and subtract your deductions (ex. expenses)). In California, being self employed means you have to pay essentially 15% as an individual, and 15% as an employer (you are your own employer), so essentially 30%. Now tax laws are changing and there are many elements that can adjust that amount, but to make the concept easy, for California, ear mark in your mind 30%. (Your state/country is likely different so do a little research on how you are taxed as a self employed individual). Example: You made $1000 this month. You had $400 in deductible expenses, so you would be taxed on the remaining $600. So 30% of $600 would be taxable. Make sense? Remember, you pay on your NET Income! But what I have learned teaching students from all over the globe, is that most people cannot rattle off how much they pay in expenses per month or year. They pay their rent, they pay their insurance, buy makeup as needed, pay for gas but have no idea what that adds up to! Since most people don’t pay too much attention to their expenses, lets remove it from the equation. Lets just look at the income. What I do is either once a week or once a month, I look at my income coming in (just log into your on-line banking app and see the deposits), and I transfer 30% of that income over to a special account I use for my taxes. Throughout the year, I pretend that money doesn’t exist, it isn’t there – I NEVER dip into it. Now 30% is overkill right because I am taking it from my Total Income (GROSS), not my NET (after my vast number of deductions)? But by doing this, now I know I can …. 1. Pay my taxes no problem. 2. Created a Built-In Savings Plan for my company that can either be invested, put into retirement, etc. 3. Never have a surprise tax bill that wipes me out! I hope you can take the concept and apply your State/Country’s tax percentages and arrange your plan of attack so when it is time to pay your 2018 taxes, you are free of the stress of the unknown! Enjoying this business advice? Get on my email list to get weekly PRO Advice!